Earlier this year, political scientists Lilliana Mason and Nathan Kalmoe presented a paper at the American Political Science Association’s annual meeting, titled “Lethal Mass Partisanship.” With data from two different national surveys, they found that 24 percent of Republicans and 17 percent of Democrats believe that it is occasionally acceptable to send threatening messages to public officials. Fifteen percent of Republicans and 20 percent of Democrats agree that the country would be better if large numbers of opposing partisans in the public today “just died,” which the authors call a “shockingly brutal sentiment.” Nine percent of both Democrats and Republicans agree that violence would be acceptable if their opponents won the 2020 presidential election. By far the biggest predictor of lethal partisanship across the board was having aggressiveness as a personality trait. This isn’t surprising, of course—aggression and violence go hand in hand. But a deeper look at aggression reveals how it fits together with other traits and shapes human behavior. Aggression all by itself is not good or bad; any of us can become aggressive when we face a direct threat. But aggression can go too far when inner and outer restraints are absent. In neurological studies, more aggressive people tend to show less activation of the default mode brain network, which is associated with empathy and emotion regulation, which in turn helps suppress aggressive impulses. As psychologist Scott Barry Kaufman notes in Scientific American, aggressive people are more likely to retaliate when treated unfairly by others, which is not necessarily a bad thing (“although they tend to care much less about whether others are treated unfairly”). After aggressiveness, Mason and Kalmoe found that “partisan identity strength”—how much being Democrat or Republican is part of who they are—is the most important factor in endorsing violence. Worse, the Republican Party has become whiter in recent decades, while the Democratic Party has become more racially diverse—which could be intensifying party antagonism. A recent study of survey data by political scientist Diana Mutz found that nothing predicted support for Donald Trump more than a feeling of threatened status among white Christians—an insight ratified by several studies from Robb Willer at Stanford Universityand the Public Religion Research Institute. While Mason and Kalmoe’s study gives us some sense of how common the tendency to accept political violence is—and some of the personality traits and belief structures that may be associated with it—a 2015 study points us in the direction of the emotions involved. In “The Role of Intergroup Emotions in Political Violence,” San Francisco State University researchers David Matsumoto and Hyisung C. Hwang and the University at Buffalo’s Mark G. Frank tried to figure out which emotions can drive violence by a group against an outgroup. They examined the emotional tone of major political speeches that occurred prior to political events throughout history, looking at the emotions expressed in words, the judgments underlying the emotions, and the nonverbal expression of the emotions that could be seen in video form. They also examined speeches made by “ideologically driven” leaders who despised opponent outgroups that resulted in violence, such as Hitler’s; and they studied those that did not, like Gandhi’s Salt March and pro-Tibet protests at the Beijing Olympics in 2008. They found that speeches which preceded violent events tended to express more anger, contempt, and disgust (ANCODI)—but not fear, happiness, sadness, or surprise. These negative emotions tended to target specific “outgroups”—Jews, in the case of Hitler’s speeches. The team also ran an experiment using another prominent protest marred by violence: the far-right rally in Charlottesville, Virginia, in 2017. Respondents were asked to what extent they thought protesting against the far-right demonstrators was a moral issue; they were then asked how acceptable it was to use violence against these far-right activists. What they found is that people were more likely to embrace violence the more they saw it as a moral issue. In other words, when it comes to violence, there’s validation and safety in numbers. The researchers dubbed this phenomenon “moral convergence,” when many people come together around a strong idea of what’s right and what’s wrong. The “risk of violent protest, in other words, may not be simply a function of moralization, but also the perception that others agree with one’s moral position, which can strongly be influenced by social media dynamics,” they write. There are many, many studies—starting with Stanley Milgram’s classic electric-shock experiments—which show that people are much more likely to inflict pain on others when an authority figure tells them to. When leaders engage in violent rhetoric, so do their followers; when they urge calm, people do calm down. Research has documented that words do have an impact on both beliefs and behaviors. For example, a 2017 Polish study found “frequent and repetitive exposure to hate speech leads to desensitization to this form of verbal violence and subsequently to lower evaluations of the victims and greater distancing, thus increasing outgroup prejudice.” As part of the study, researchers surveyed participants on how frequently they encountered hate speech against refugees; they found that those who were more exposed to hateful words were more prejudiced against the group and more accepting of restrictive immigration policy. Taken together, these studies suggest that our political leadership—everyone from pundits on cable news to the President of the United States—would do well to avoid promoting the political tribalism that leads people to strongly identify with one group and demonize the other. In short, watch your aggression, avoid identity politics, keep your emotions in check, lay off the moral grandstanding, and quit putting so much stock into political leaders and pundits. …In one study, Panagopoulos sent postcards to a subset of random voters before a special election in New York and before a gubernatorial election in New Jersey. The postcards contained either a message encouraging people to vote or a message thanking them for having voted in a recent election. Then, he compared voting percentages for those two groups to a control group who received no postcards. His findings showed that voters receiving the gratitude postcard voted significantly more—two to three percentage points more—than those not receiving postcards. …“Making people feel good by reinforcing the notion that society is grateful for their participation in the political process reminds people that they have a role to play and reinforces their willingness to be responsive,” says Panagopoulos. …[I]n another experiment, he sent postcards thanking people for political participation, in general—without reference to past voting—while others received either the thanks for voting or the reminder postcards used in the other experiments. …In one study, people who received information about their own voting behavior in the past seemed to increase their propensity to vote in an upcoming election. Another study found that people will vote more in an election when they see that people they are close to are voting, and that this behavior can spread through social networks. Altruism, gratitude, friendships, pride, and shame are just a few reasons people go to the polls. Political institutions, ranging from autocratic regimes to inclusive, democratic ones, are widely acknowledged as a critical determinant of economic prosperity (e.g. Acemoglu and Robinson 2012, North, Wallis, and Weingast 2009). They create incentives that foster or inhibit economic growth. Yet, the emergence and global variation of growth-enhancing, inclusive political institutions in which people broadly participate in the governing process and the power of the elite is constrained, are not well understood. Initially, inclusive institutions were largely confined to the West. How and why did those institutions emerge in Europe? This article contributes to the debate on the formation and global variation of inclusive institutions by combining and empirically testing two long-standing hypotheses. First, anthropologist Jack Goody (1983) hypothesized that, motivated by financial gains, the medieval Catholic Church implemented marriage policies—most prominently, prohibitions on cousin marriage—that destroyed the existing European clan-based kin networks. This created an almost unique European family system where, still today, the nuclear family dominates and marriage among blood relatives is virtually absent. This contrasts with many parts of the world, where first- and second-cousin marriages are common (Bittles and Black 2010). Second, several scholars have hypothesized that strong extended kin networks are detrimental to the formation of social cohesion and affect institutional outcomes (Weber, 1958; Todd, 1987; Augustine, 1998). Theologian Augustine of Hippo (354–430) pointed out that marrying outside the kin group enlarges the range of social relations and “should thereby bind social life more effectively by involving a greater number of people in them” (Augustine of Hippo, 354-430 / 1998, p. 665). More recently, Greif (2005), Greif and Tabellini (2017), Mitterauer (2010), and Henrich (forthcoming) combined these two hypotheses and emphasized the critical role of the Church’s marriage prohibitions for Europe’s institutional development (pg. 2). The analysis demonstrates that already before the year 1500 AD, Church exposure and its marriage regulations are predictive of the formation of communes—self-governed cities that put constraints on the executive. The difference-in-difference analysis does not reveal pre-trends and results are robust to many specifications. They hold within historic political entities addressing concerns that the relation is driven by other institutional factors and when exploiting quasi-natural experiments where Church exposure was determined by the random outcomes of medieval warfare. Moreover, exploiting regional and temporal variation in marriage regulations suggests that the dissolution of kin networks was decisive for the formation of communes. 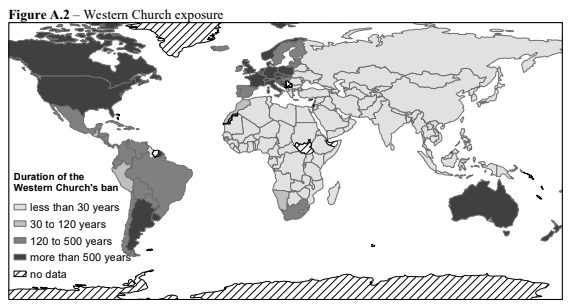 The study also empirically establishes a robust link between Church exposure and dissolution of extended kin networks at the country, ethnicity and European regional level. A language-based proxy for cousin marriage—cousin terms—offers a window into the past and rules out that the dissolution was driven by more recent events like the Industrial Revolution or modernization. Moreover, the study reports a robust link between kin networks, civicness and inclusive institutions. The link between kin networks and civicness holds within countries and—getting closer to causality—among children of immigrants, who grew up in the same country but vary in their vertically transmitted preference for cousin marriage. Kin networks predict regional institutional failure within Italy, ethnicities’ local-level democratic traditions and modern-day democratic institutions at the country level. Measures for the strength of pre-industrial kin networks rule out contemporary reverse causality or the possibility that the estimates are driven by contemporary omitted variables. The analysis also demonstrates that the association between kin networks and the formation of inclusive institutions holds universally—both within Europe and when excluding Europe and countries with a large European ancestry. This universal link strengthens the hypothesis that the Church’s marriage regulations, and not some other Church-related factor, were decisive for European development. Underlying these early institutional developments was most likely a psychology that, as a consequence of dissolved kin networks, reflects greater individualism and a more generalized, impartial morality (Schulz et al. 2018). This is a building block not only for inclusive institutions but also for economic development more generally. For example, transmission of knowledge across kin networks and the shift away from a collectivistic culture toward an individualistic one, a culture of growth, may have further contributed to Europe’s economic development (Mokyr, 2016; de la Croix, 2018). …To build strong, functional, inclusive institutions and to foster democracy, the potentially deleterious effect of dense kin networks must be considered. Also, simply exporting established formal institutions to other societies without considering existing kin networks will likely fail. Policies that foster cooperation beyond the boundaries of one’s kin group, however, have a strong potential to successfully diminish the fractionalization of societies. These can be policies that encouraging marriages across kin groups. More generally, policies that foster interactions that go beyond the boundaries of in-groups such as family, close friends, social class, political affiliation or ethnicity are likely to increase social cohesion (pg. 41-42). a recent large-scale study indicated positive associations between social ranking and prosocial behaviour (Korndörfer, Egloff, & Schmukle, 2015), and further research has supported that individuals from higher SES are more generous than individuals from lower SES (Smeets, Bauer, & Gneezy, 2015). Other studies have detected a more nuanced link, where general relations between class and ethical behaviour are not evident without the presence of moderators, such as level of social inequality in the community and the social class of the target (Côté, House, & Willer, 2015; Trautmann, van de Kuilen, & Zeckhauser, 2013; Van Doesum, Tybur, & Van Lange, 2017). Finally, other research has found no relation between social class and ethical behaviour (Van Doesum, Tybur, & Van Lange, 2017). The authors “attempted to directly replicate Piff et al.’s Study 5 (2012),” which tested individuals’ willingness to lie in a negotiation task. In an effort to increase experimental power, the present studies sought to increase sample size from 108 to 270 (i.e., 2.5 times larger), which is considered the current standard for replication protocols (Simonsohn, 2015). We collected two independent samples in an effort to provide more opportunity to replicate the original results (e.g., larger number of participants across samples helps mitigate issues associated with sampling error). Some of our findings were consistent with those of Piff et al., such as the significant relations between attitudes toward greed and unethical behaviour (i.e., dishonesty) as well as between social class and greed (in sample 2 only), but we did not obtain any evidence of a positive association between social class and unethical behaviour in either sample. Further, we found inconclusive evidence for the mediation model proposed by Piff et al. across the two samples. Perhaps the crucifixion of the rich isn’t the most empirically-based idea. Increased sorting could reflect identification with groups that better match our values. Perhaps Republicans and Democrats can’t compromise because their policy preferences are irreconcilable. However, this doesn’t explain why Americans personally dislike political opponents with such intense fervor. U.S. liberals and conservatives not only disagree on policy issues: they are also increasingly unwilling to live near each other, be friends, or get married to members of the other group. …Now, surprising new research suggests that what divides us may not just be the issues. In two national surveys, political psychologist Lilliana Mason of the University of Maryland measured American’s preferences on six issues such as abortion and gun control, how strongly they identified as liberals and conservatives, and how much they preferred social contact with members of their own ideological groups. Identifying as liberal or conservative only explained a small part of their issue positions. (This is consistent with findings that Americans overestimate the differences in policy preferences between Republicans and Democrats.) Next, Mason analyzed whether the substantial intolerance between liberals and conservatives was due to their political identities (how much they labelled themselves as “liberal” or “conservative”) or to their policy opinions. For example, who would be more opposed to marrying a conservative: a moderate liberal who is pro-choice, or a strong liberal who is pro-life? Across all six issues, identifying as liberal or conservative was a stronger predictor of affective polarization than issue positions. Conservatives appear particularly likely to feel cold towards liberals, even conservatives who hold very liberal issue positions. …[W]e see that Americans are increasingly divided not just on the issues but also on their willingness to socialize across the political aisle. It is normal that society manifests new social cleavages as it heals old ones. However, when identities are fused with policies that have vast, long-term consequences (e.g., war, taxes, or the Paris Agreement), these divisions imperil our ability to select policies based on their expected outcomes. To paraphrase anthropologist John Tooby, forming coalitions around policy questions is disastrous because it pits our modest urge for truth-seeking against our voracious appetite to be good group members. If Americans slide into seeing all policy debates as battles between Us vs. Them, we stop selecting policies based on their actual content. Ironically, this would lead to choosing policies that don’t match our personal values, because the content and evidence would become less important than the source. In short, seeing politics as a battle may worsen things for everyone. Once again, politics makes us into worse people. our interpretations of testimony like Kavanaugh’s, or Christine Blasey Ford’s earlier on Thursday, will be shaped by what we already believe. The Kavanaugh confirmation fight and Ford’s allegation that he sexually assaulted her are taking place in a political context, tapping into partisan identities. But even without those particular biases, humans just aren’t very good at reading people. And that’s why testimony is “no substitute for a good, solid, thorough investigation and finding of the facts,” said Brian Fitch, a psychologist and retired Los Angeles County sheriff’s lieutenant. If you generally identify on the political left and found Ford’s testimony “credible” or if you generally identify on the political right and found Kavanaugh’s testimony “compelling”, then there was likely nothing credible, compelling, or rational about how you came to that conclusion. It was more likely political hooliganism in action.